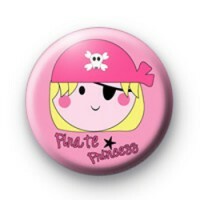 This is a listing for a 25mm (1 inch) Pink Pirate Princess Button Badge. This is a cute light pink badge with a picture of a Pirate Princess. If you're throwing a children's Pirate themed birthday party our Pirate badges would make cute party bag favors. Or you can add our nautical themed pirate badges to your fancy dress costume.